the goal: take photos daily and pick one per day to post. do this for a month. no theme this time. day 365: "level complete". what started out as taking 1 photo a day for a month finally landed me here one year later. it was definitely worth the work as i look back at some cool memories. 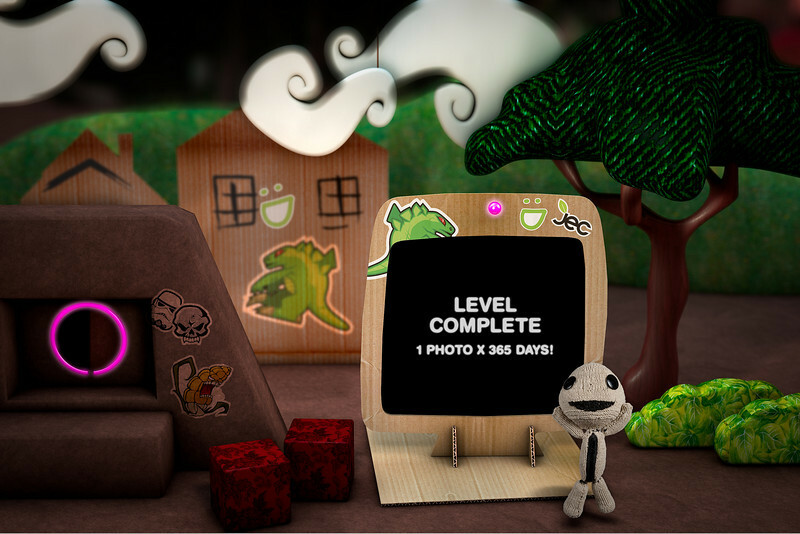 the image above is a composite of a photo of sackboy taken today along with the scene created in cinema 4D. the scene is based on the littleBigPlanet game for PS3 and took about a day to design and render. the stickers are illustrations i created in the past and added post. sackboy took me about 2 weeks to make and was created specifically for this shot. he has since been abducted by my daughter! Many congrats! I was only a week or so ahead of you, so I know exactly how you feel.